"Had a great experience at Whitson on 86th st. Awesome staff with great service." "The staff at Whitson Vision have always been kind and very helpful." "Dr. Colon is very complete, caring, and compassionate. He is very trustworthy." "Fantastic experience. I highly recommend this practice." "Absolutely perfect experience. Cannot say enough positive things about Whitson Vision." "Amazing practice, dedicated staff, exceptional experience." "Absolutely love all the doctors and staff! Highly recommended Whitson Vision." "Dr. Whitson was very professional and knowledgeable. I would recommend him to all..."
WE PROUDLY OFFER THE REGION'S PREMIER LASIK SURGERY IN INDIANAPOLIS, AVON AND ALL OF INDIANA AND BEYOND. 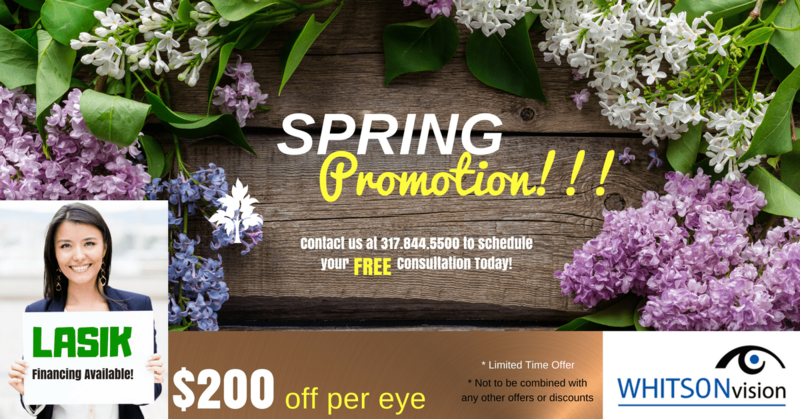 IMAGINE BEING ABLE TO SEE CLEARLY ALL OF THE BEAUTIFUL SIGHTS THAT INDIANA HAS TO OFFER, WITHOUT THE HASSLE OF GLASSES OR CONTACTS; THIS IS WHAT THE PROFESSIONAL LASIK SURGEONS HERE AT WHITSON VISION CAN OFFER THROUGH STATE-OF-THE-ART LASIK EYE SURGERY. FROM YOUR INITIAL CONSULTATION THROUGH POST-OPERATIVE CARE, OUR DEDICATED LASIK SURGEONS WILL ENSURE THAT YOUR LASIK PROCEDURE IS COMFORTABLE, FAST AND EFFECTIVE.- WE LOOK FORWARD TO HELPING YOU SEE THE WORLD CLEARLY. WHEN TO HAVE YOUR VISION PROCEDURE SHOULD BE THE QUESTION, NOT HOW TO PAY FOR IT. WE'D LIKE TO MAKE THAT DECISION EVEN EASIER FOR OUR PATIENTS. AS A SERVICE TO OUR PATIENTS, WHITSON VISION IS PLEASED TO OFFER THE CARECREDIT CARD, NORTH AMERICA’S LEADING PATIENT PAYMENT PROGRAM*. CARECREDIT HAS A FULL RANGE OF PAYMENT PLANS TO MEET EVERY FINANCING NEED, INCLUDING NO INTEREST AND LOW INTEREST OPTIONS. Age-related macular degeneration isn’t the end of the road, but rather a quick detour on your eyes’ journey. Astigmatism, nearsightedness, and farsightedness are some of the most common vision problems that keep you from seeing clearly without glasses or contacts. If you’re tired of wearing glasses or contacts, find out how LASIK can improve your vision. Don’t let a wide selection of optical frames overwhelm you. By keeping these five important considerations in mind, you can choose the eyeglass frames that suit you best.